Just 90 minutes from Santa Fe or Albuquerque, you can dive into a world apart … and explore some of the oldest tribal communities in the United States. The Spanish Conquistadors – no doubt impressed by the distinctive Adobe buildings they saw – adapted the word to refer to the village inhabitants, perhaps to honour the architectural achievements they found, or simply to distinguish the Pueblo People from other Native Americans. 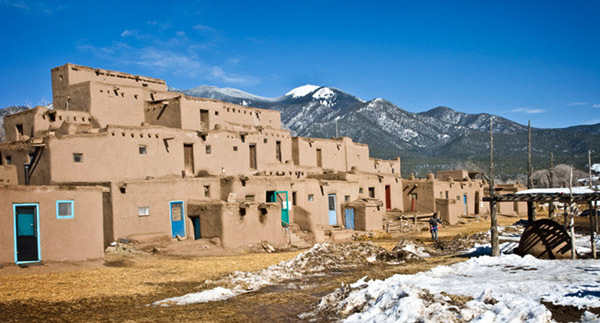 Taos Pueblo people have lived at the foot of the Sangre de Cristos Mountains for around one thousand years. Traditional Tiwa-speaking members of the old pueblo do not use electricity or indoor plumbing and many of the traditional ceremonies are closed to visitors. Taos, the northernmost of all the pueblos, is the only Native American community designated both as a Unesco World Heritage site and a National Historic Landmark. A crystal clear stream runs through the center of the site, with Pueblo buildings standing on either side not much different than they were 600 years ago. Acoma Pueblo, known locally as “Sky City,” was built around 1,000 years ago on a 357-foot sandstone mesa (an area of land shaped like a table-top with steep cliff sides) for strategic defence. 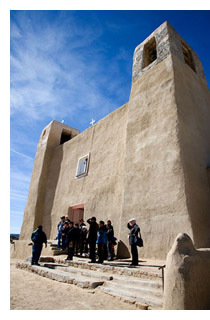 Acomans claim that their 70-acre village is the oldest continuously inhabited Pueblo in the United States. Fewer than 50 Acomans live in Sky City year-round today. The rest live in nearby villages. But throughout the year, Acomans gather on the mesa to observe their cultural, social and religious customs. Visitors to Taos, Acoma and other Pueblos, can enjoy Native foods and browse hand-made gift items on display in the small shops inside the Pueblo. 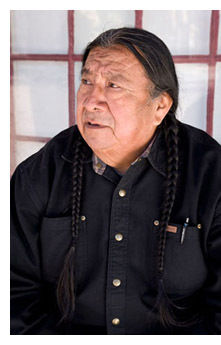 The Native American people there are very skilled in leather work, pottery and other crafts. You’ll find examples of fine pottery and turquoise jewelry work, and drums made from cow hide and hollow tree stumps. But not only that … you may feel you’ve found another world. Here, people live life in a way that is solidly based in their culture and spirituality, and in many ways, deeply rooted in the past. These are proud and noble people, who exude warmth and a sense of peace and calm. 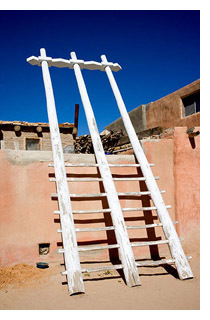 From Santa Fe, you can visit Taos Pueblo – which is about an hour’s easy drive on the outskirts of picturesque Taos Town, then journey farther south along I-25 and I-40 through stunning south-western landscapes to Acoma “Sky City” Pueblo. If you wish to purchase this article for your publication, click here to contact the author directly.